This is an EXCELLENT flyer to give to your clients, and it’s yours FREE! 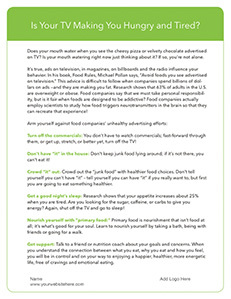 Yes, it’s true, ads on television, in magazines and on billboards and radio are designed to make us hungry! These ads influence our behavior and add to the growing weight problem among children and adults. Help your clients resist temptation with these proven tips and strategies! Welcome to our FREE Resources page! Here you can download some of my favorite coaching tools that I am happy to share to help you grow your business and promote your workshops. And if you don’t have a workshop presentation yet, don’t worry! That’s what this site is all about! We’ve created already-done-for-you, customizable Workshops-to-Go and our Coaching Essentials Guide and Toolkit, to help you present and coach with confidence! Just look up at the menu bar and click Workshops-to-Go and Coaching Essentials to see all of our offerings and how they can help you have the health coaching practice you’ve always dreamed of!